In the summer of 2009, leading professionals from industry, government, and academia gathered for a free–spirited debate on the future trends in microelectronics. This volume represents the summary of their contributions. Providing a cohesive exploration and holistic vision of the field, it features thirty–four chapters from experts all over the world, in far–ranging disciplines within microelectronics from energy (photovoltaic and otherwise) to semiconductor device based remote sensing and beyond. What is the future beyond shrinking silicon devices and the field–effect transistor principle? Are alternative materials, ranging from graphene to magnetic semiconductors to chalcogenides, likely to reach technological insertion? Is there practicality in fashionable topics like quantum computing, synaptic computing, spintronics, and superconducting computing? What are the most attractive system applications of optoelectronic hybrids? Are there green pastures beyond the traditional semiconductor technologies? Is energy–related research likely to boost the prospects of the microelectronics industry? By identifying the scenario for the future evolution of microelectronics, this title presents a tremendous opportunity for constructive action on behalf of microelectronics professionals; researchers in communications, solid state physics, electronics and materials science; government policymakers and planners; and investors and consultants. It offers both professionals and students an informed, broad, and forward–looking overview of the entire field. Preface (S. Luryi, J. M. Xu, and A. Zaslavsky). Nanophotonics for Information Systems (Y. Fainman). What Will Modern Photonics Contribute to the Development of Future Optical Communication Technology? (Djafar K. Mynbaev). Ultrafast Nanophotonic Devices For Optical Interconnects (N. N. Ledentsov). Intersubband Quantum–Box Lasers: Progress and Potential as Uncooled Mid–Infrared Sources (D. Botez, G. Tsvid, M. D′Souza, J. C. Shin, Z. Liu, J. H. Park, J. Kirch, L. J. Mawst, M. Rathi, T. F. Kuech, I. Vurgaftman, J. Meyer, J. Plant, G. Turner, and P. Zory). GaSb–based Type–I Laser Diodes Operating at 3 µm and Beyond (L. Shterengas, G. Kipshidze, T. Hosoda, and G. Belenky). Bridging Optics and Electronics with Quantum Cascade Lasers, Antennas, and Circuits (J. Faist, C. Walther, M. Amanti, G. Scalari, M. Fischer, and M. Beck). Towards Intersubband Polaritonics: How Fast Can Light and Electrons Mate? (A. A. Anappara, L. Sorba, A. Tredicucci, G. Günter, A. Sell, A. Leitenstorfer, R. Huber, S. De Liberato, C. Ciuti, and G. Biasiol). Si3N4/SiO2 Planar Photonic Structures Fabricated by Focused Ion Beam (L. A. M. Barea, F. Vallini, D. L. S. Figueira, A. Da Silva Filho, N. C. Frateschi, and A. R. Vaz). 2 ELECTRONIC DEVICES AND SYSTEMS. Silicon–Based Devices and Materials for Nanoscale CMOS and Beyond–CMOS (F. Balestra). Device Proposals Beyond Silicon CMOS (P. M. Solomon). GeOI as a Platform for Ultimate Devices (W. Van Den Daele, S. Cristoloveanu, E. Augendre, C. Le Royer, J.–F. Damlencourt, D. Kazazis, and A. Zaslavsky). Simulation of Self–Heating Effects in Different SOI MOS Architectures (Enrico Sangiorgi, Marco Braccioli and Claudio Fiegna). Nanowires: Technology, Physics and Perspectives (D. Grützmacher, Th. Schäpers, S. Mantl, S. Feste, Q. T. Zhao, H. Hardtdegen, R. Calarco, M. Lepsa, and N. Demarina). Emerging Nanotechnology for Integration of Nanostructures in Nanoelectronic Devices (T. Baron, C. Agraffeil, F. Dhalluin, M. Kogelschtaz, G. Cunge, T. Chevolleau, B. Salem, B. Salhi, H. Abed, A. Potié, L. Latu–Romain, C. Ternon, K. Aissou, L. Montès, Mur, G. Molas, B. De Salvo, E. Jalaguier, T. Ernst, P. Ferret, P. Gentile, and N. Pauc). Scrolled Si/SiGe Heterostructures as Building Blocks for Tube–Like Field–Effect Transistors (N. V. Demarina and D. Grützmacher). Silicon Nanowire–Based Nonvolatile Memory Cells: Progress and Prospects (Qiliang Li, X. Zhu, Y. Yang, D. E. Ioannou, J. S. Suehle, and C. A. Richter). Prospects and Challenges of Next–Generation Flash Memory Devices (Jang–Sik Lee). Chalcogenide Glassy Semiconductors – Could They Replace Silicon in Memory Devices? (K. D. Tsendin). Current Status and Recent Developments in RSFQ Processor Design (M. Dorojevets). 1/f Noise: The Funeral is Cancelled (or Postponed) (M. E. Levinshtein and S. L. Rumyantsev). 3 PHYSICS, BIOLOGY, AND OTHER SISTER SCIENCES. Spin Hall Effect (M. I. Dyakonov). Can Biology Provide Creative Solutions for Next–Generation Memory Devices? (W. E. van den Berg and S. A. Kushner). Spin Screening of Magnetization Due to Inverse Proximity Effect in Superconducting/Ferromagnetic Bilayers (V. Shelukhin, M. Karpovski, A. Palevski, J. Xia, A. Kapitulnik, and A. Tsukernik). Silicon for Spintronic Applications: Strain–Enhanced Valley Splitting (V. Sverdlov, O. Baumgartner, T. Windbacher, and S. Selberherr). Graphene–Based Terahertz Devices: Concepts and Characteristics (V. Ryzhii, M. Ryzhii, A. Satou, N. Ryabova, T. Otsuji, V. Mitin, F. T. Vasko, A. A. Dubinov, V. Y. Aleshkin, and M. S. Shur). Directed Self–Assembly – A Controllable Route to Optical and Electronic Devices Based on Single Nanostructures (R. L. Williams, D. Dalacu, M. E. Reimer, K. Mnaymneh, V. Sazonova, P. J. Poole, G. C. Aers, R. Cheriton, S. Frédérick, D. Kim, J. Lapointe, P. Hawrylak, and M. Korkusi ski). 4 SENSORS, DETECTORS, AND ENERGY. Three–Dimensional Position–Sensitive Wide Bandgap Semiconductor Gamma–Ray Imaging Detectors (Zhong He). Semiconductor Scintillator for Three–Dimensional Array of Radiation Detectors (Serge Luryi and Arsen Subashiev). Semiconductor Gamma Radiation Detectors: Band Structure Effects in Energy Resolution (Arsen Subashiev and Serge Luryi). 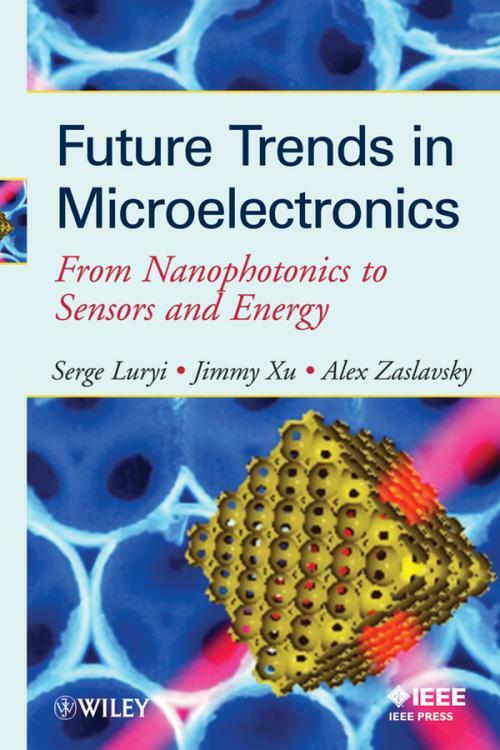 The Future of Microelectronics is Macroelectronics (M. A. Alam, N. Pimparkar, and B. Ray). An Integration Challenge: Information and Communication Technologies to Address Indoor Air Quality in Commercial Buildings (M. D′Iorio). Quantum–Dot Infrared Photodetectors: In Search of the Right Design for Room–Temperature Operation (A. Sergeev, V. Mitin, L. H. Chien, and N. Vagidov). Treating the Case of Incurable Hysteresis in VO2 (M. Gurvitch, S. Luryi, A. Polyakov, and A. Shabalov). Exploratory Studies on Silicon–Based Oxide Fuel Cell Power Sources Incorporating Ultrathin Nanostructured Platinum and Cerium Oxide Films as Anode Components (Bo–Kuai Lai, A. C. Johnson, H. Xiong, C. Ko, and S. Ramanathan).